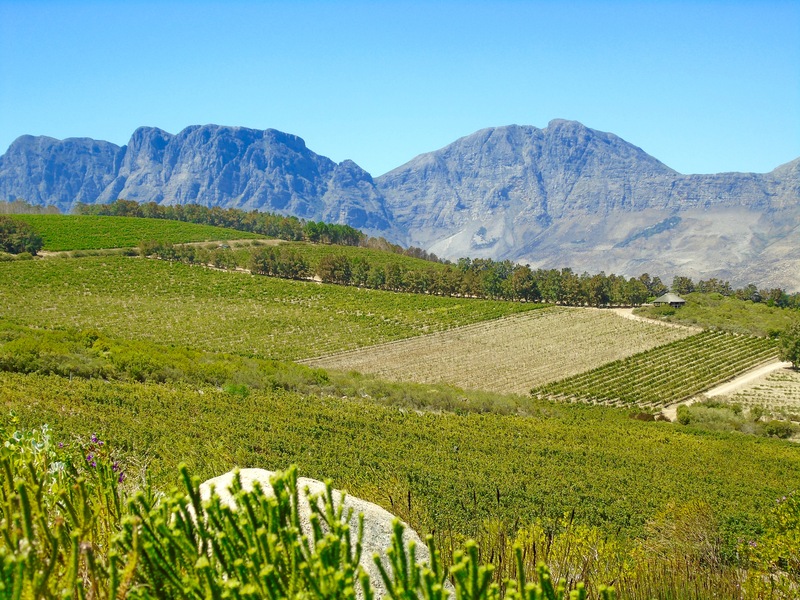 Today we’re heading back to the Somerset West area and climbing to the top of another hill to The Restaurant at Waterkloof. 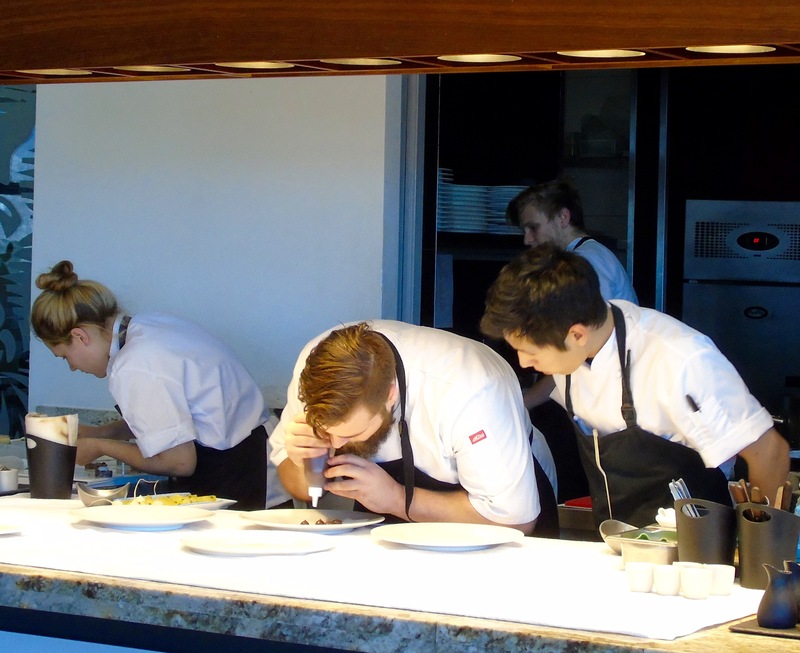 It’s rated the third best restaurant in South Africa in the 2016 Eat Out Mercedes Benz Restaurant Awards – behind The Test Kitchen and La Colombe in Cape Town. I had already been to both of these and had heard very mixed opinion of Waterkloof so was looking forward to making the comparison for myself. The Restaurant is housed in a modern building with floor to ceiling glass and sensational views of False Bay and across the vines to the Hottentots Holland mountains. It’s cleverly designed with a huge glass box jutting out to make the most of these views – you need to be enclosed as the wind really howls up here. So don’t come expecting an al fresco meal. 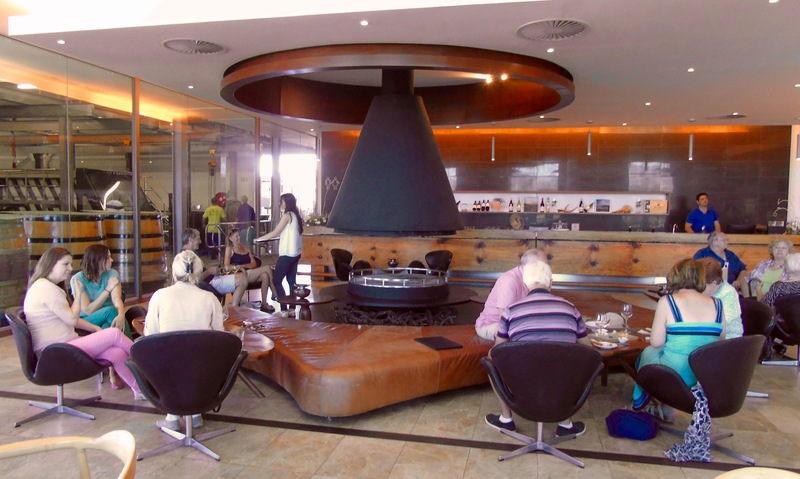 The interior is modern and stylish with a circular fireplace central to the tasting area and the restaurant alongside. All open plan with light flooding in. You can choose from the two or three-course a la carte menu or the tasting menu (with or without wine pairing). Bear in mind that whatever you choose you’re going to get more than you’re expecting as there are several delightful surprises along the way. We opted for two courses which in reality meant five with the extras. Like this bread and butter extravaganza. 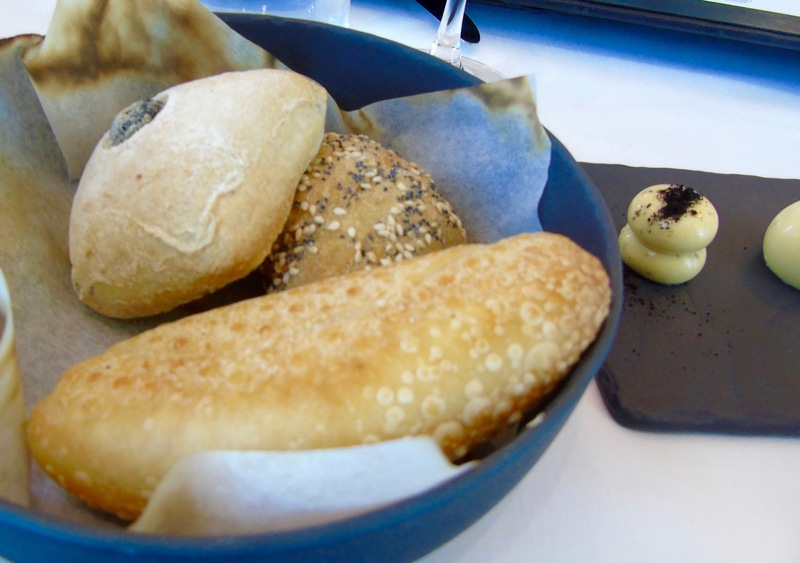 Three rolls and five different types of butter to get you started – including smoked aioli, mustard butter, chive butter, garlic butter and plain butter. Never has this humble dish been more delicious or more beautifully presented. 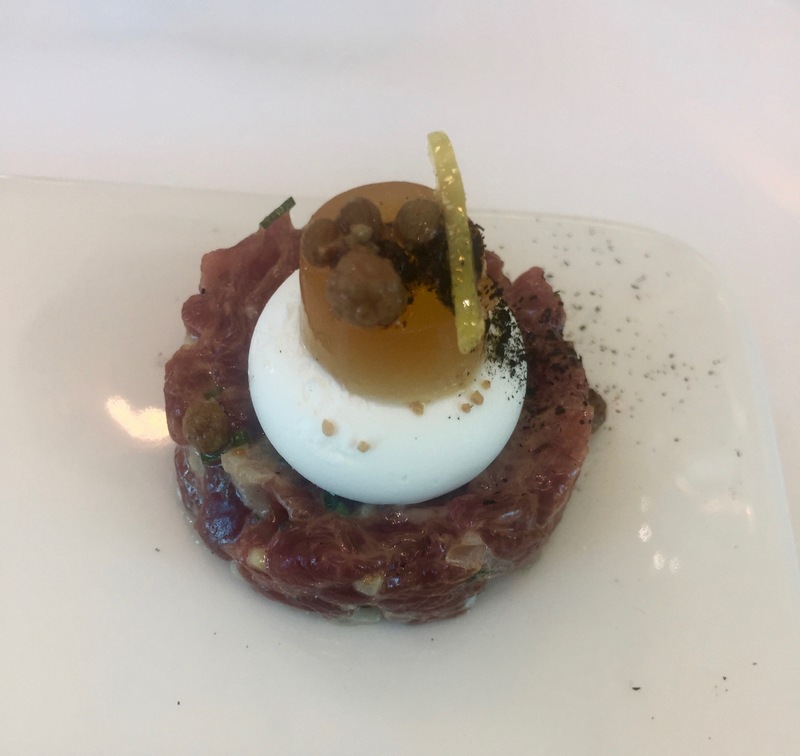 And then our next surprise – the amuse bouche. A mini Springbok tartare topped with with salmon cream, miso jelly and pickled seeds. A totally scrumptious combination of flavours and textures. 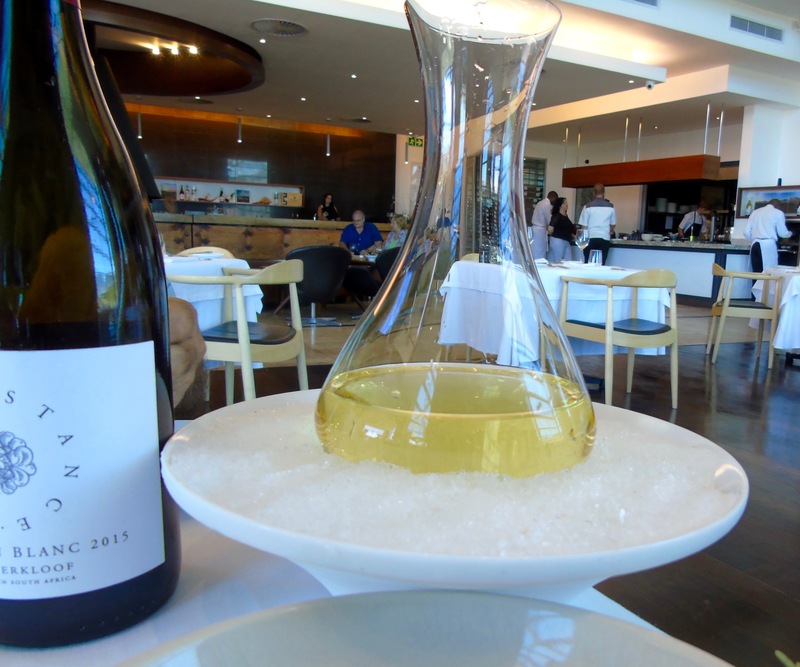 We ordered a bottle of Waterkloof’s Circumstance Sauvignon Blanc and (unusually for white) it was decanted and balanced in a bowl of crushed ice. Quite a charming touch, I thought – and doesn’t it look lovely. You can see the tasting area and the open kitchen in the background. 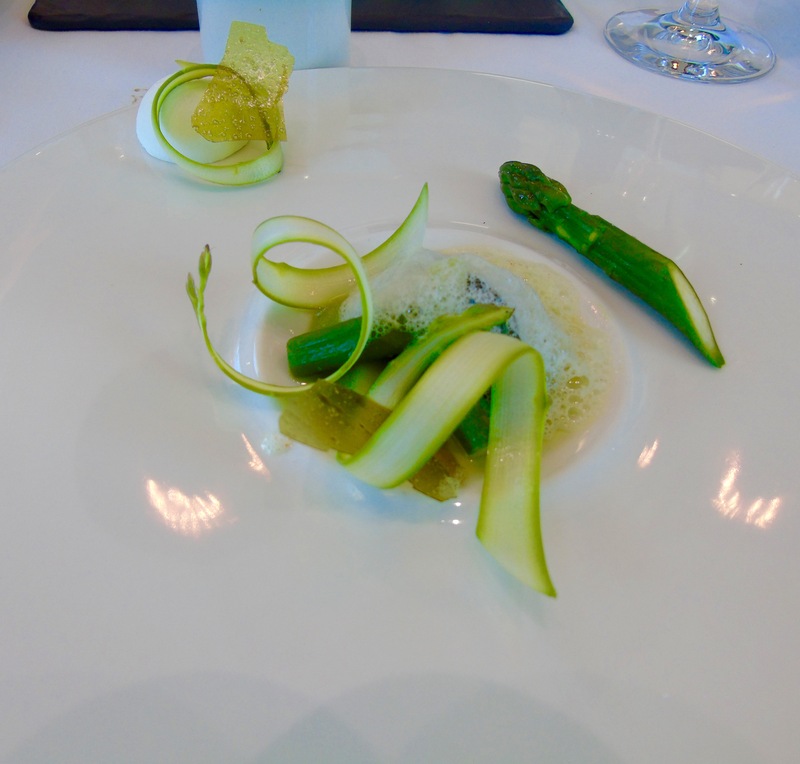 My starter of asparagus done several ways was served with an amazingly creamy parmesan mousse. What a beautiful plate of food and the delicate flavours blew me away. A truly wonderful dish for asparagus lovers like me. 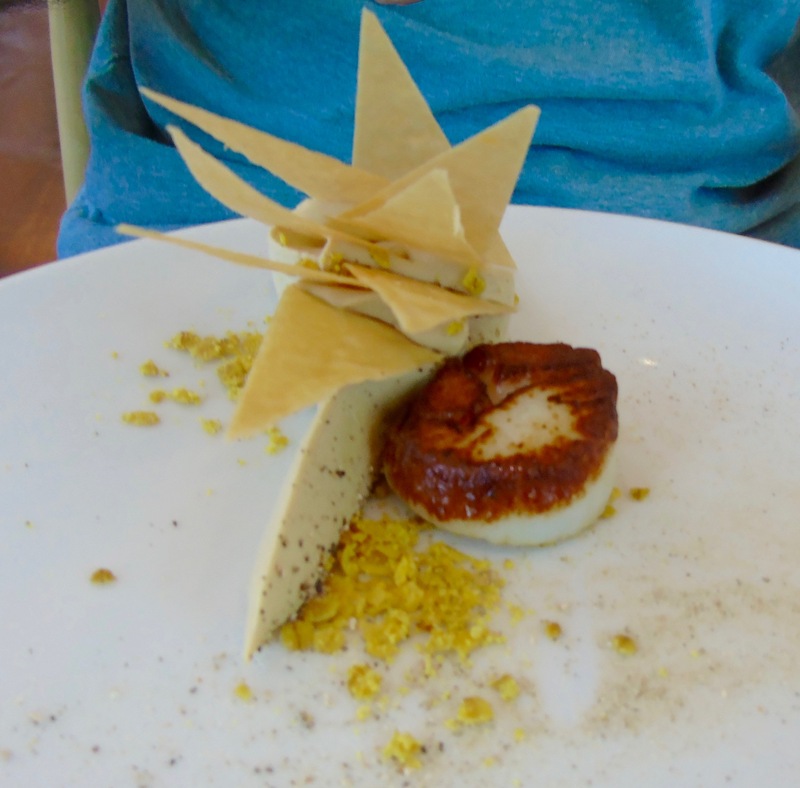 The plump scallop was served with an rich and earthy porcini mousse, that melted its bursting flavours into the mouth. Two outstanding starters. The attention to detail on each dish is incredible and you can see the effort going into every plate in the open kitchen. 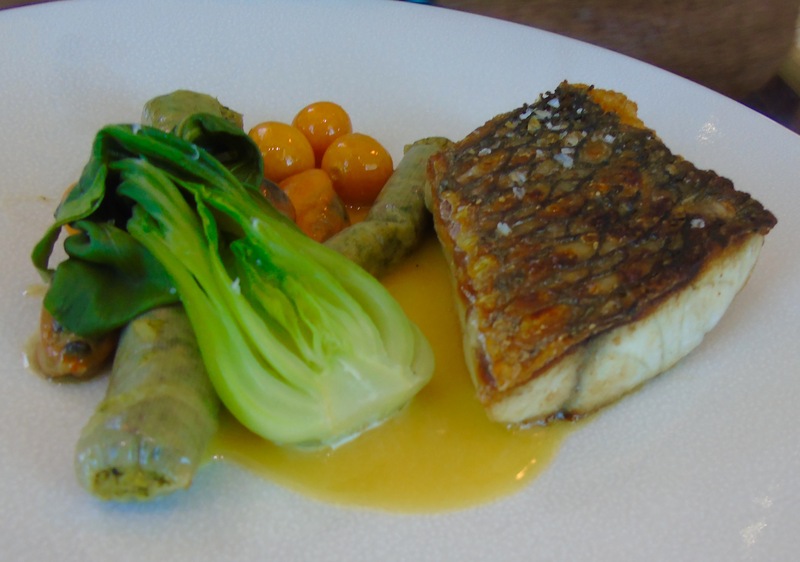 The Mauritius sea bass came with confit leek, Saldanha mussels and cape gooseberries. The fish was sweet and perfectly cooked and balanced well with the sharpness of the gooseberries. And who’d have thought of doing confit leeks? A truly ingenious idea. And how’s this for another masterpiece of plating? 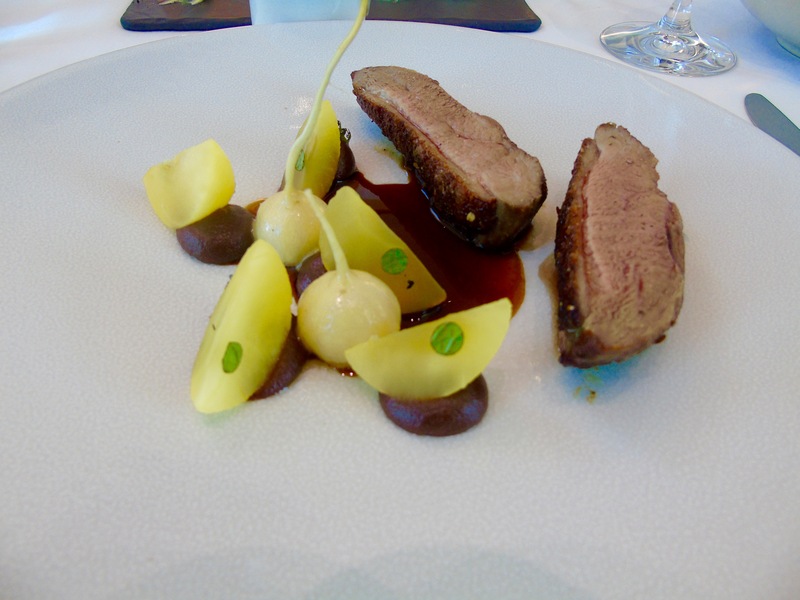 The Joostenberg Vlakte duck breast was served with saffron apples and glazed turnips. Beautifully flavoursome and tender duck matched well with the slight sweetness of the apples and turnips – and the saffron influence came through strongly. Seriously want to know how to make saffron apples, they were so perfectly infused with one of my favourite spices. So that was the end of our two-course choice. And it was fabulous. Important for me to point out that portions are on the small side at Waterkloof so if you’re expecting large plates of food you’re going to be disappointed. Personally I like eating lighter and with the extras this was plenty enough for lunch for me. In fact we decided against dessert as we were full. 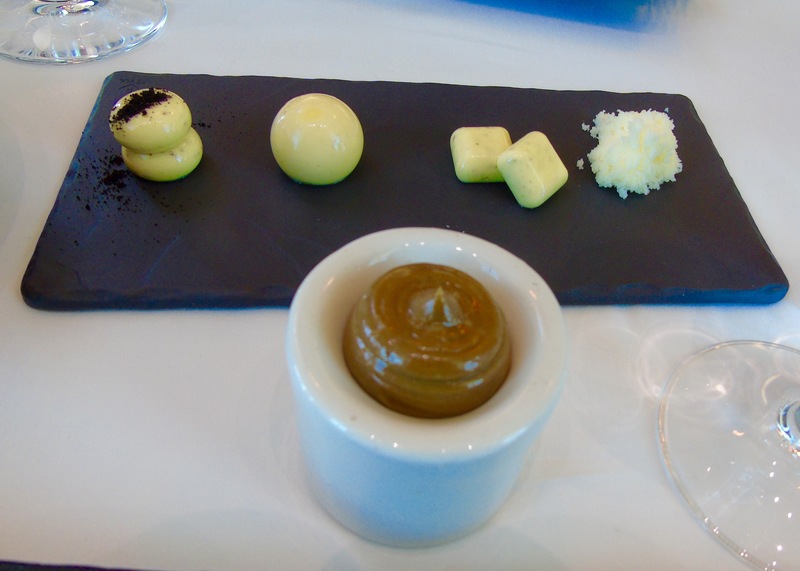 But then the selection of petit fours was delivered to our table – well, I think I’d describe them as pudding actually. 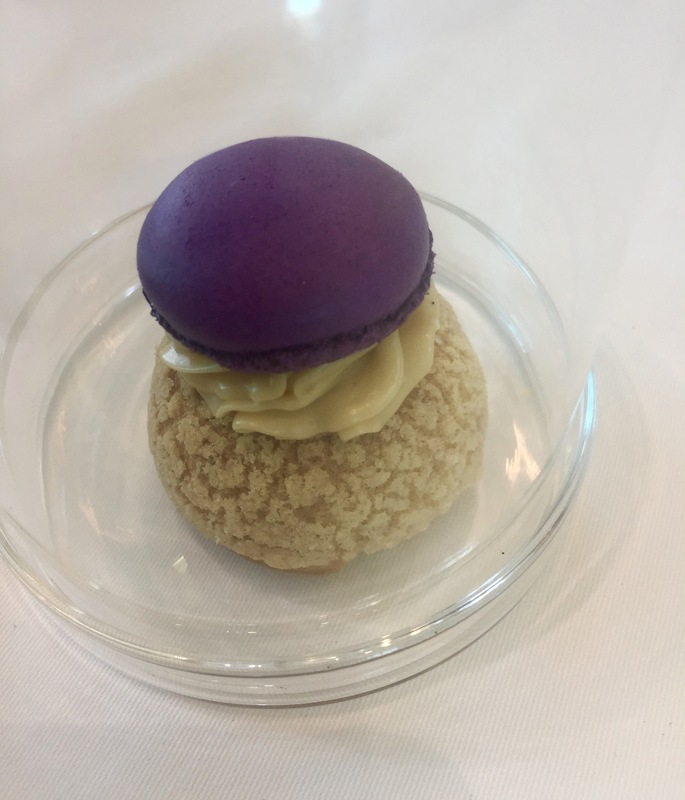 This beautiful purple creation was delivered in a mini bell jar – the lightest of pastries filled with a blackcurrant mousse and topped with a blackcurrant macaron. Everything melted in my mouth with a zing of flavours. 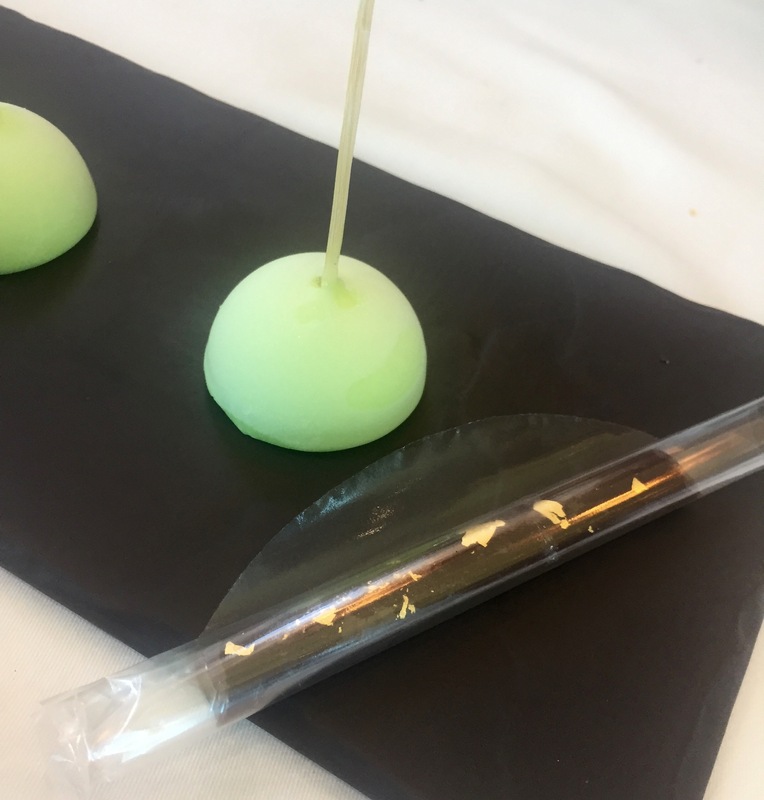 There were also delicate chocolate toffee straws and little lollies of mint and coconut ice cream encased in white chocolate to pop into your mouth. Stunning. So now I’ve been to South Africa’s top-three (on one list anyway) and I’d put Waterkloof first of the three of them. 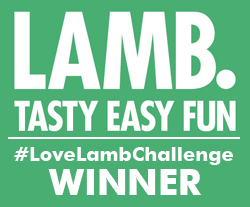 A thoroughly wonderful and exciting foodie experience. And here’s the glass box that juts out of the side of the building making the most of the sea views. Two courses from the a la carte menu cost R420 (£26 at today’s exchange rate). Of course you got all the extras included for this. The bottle of Circumstance Sauvignon Blanc cost R190 (£12 at today’s exchange rate). It’s really good value for great fine dining. 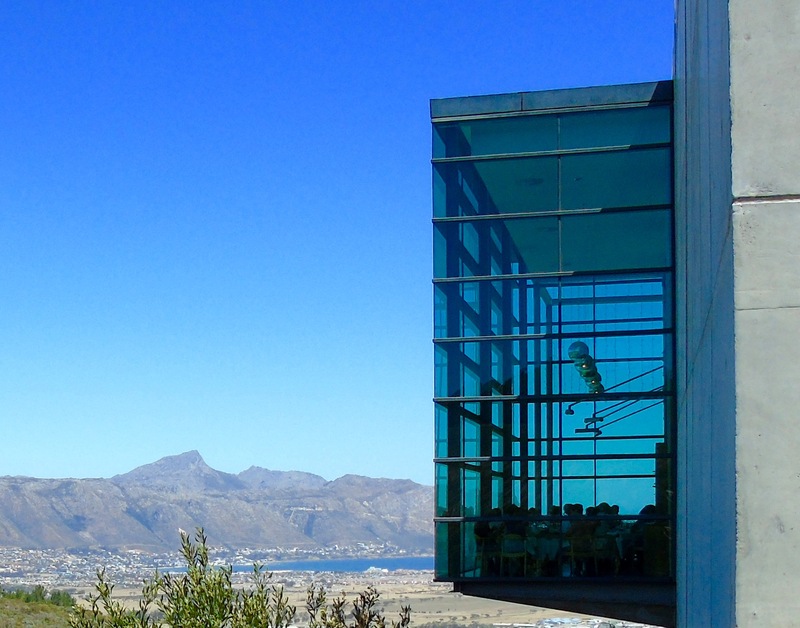 The Restaurant at Waterkloof is at Sir Lowry’s Pass Road, Somerset West. I really loved it Esme. Would go back tomorrow. I know a lot of South Africans don’t love it because the portions are too small for them!